Iron is essential for life, and the average adult human body contains 3.5 grams of iron. Both excess iron and iron deficiency are pathological, so regulation of iron uptake and distribution to tissues in which it will be used requires a sophisticated metabolic system to monitor iron status and distribution and to assure iron homeostasis. This situation is complicated further by the insolubility of non-chelated Fe 3+ at physiological pH and competition for iron with infectious bacteria and parasites. Hemopexin, transferrin, Dcytb, and bacterioferritin are the principal proteins involved in iron metabolism that we are studying. Hemopexin is the heme scavenging glycoprotein from human plasma that removes heme released to the circulation by hemolysis or rhabdomyolysis and thereby provides protection against oxidative damage to tissue catalyzed by unbound heme. Transferrin is the plasma protein that is primarily responsible for transport and distribution of iron from the gut and liver to tissues requiring iron. Dcytb is an integral membrane protein of the duodenal mucosa that has been proposed to be responsible for reduction of dietary iron from Fe 3+ to Fe 2+ and thereby promote iron uptake by the divalent metal transporter, Dmt1. Bacterioferritin is a bacterial form of ferritin that differs in part in that it is comprised of a single type of subunit and is able to bind heme. For these proteins, our general approach is to apply a variety of spectroscopic, kinetic, thermodynamic and structural strategies to characterize the manner in which the protein environment influences the chemical and physical properties of the iron center. Our studies concerning recombinant forms of transferrin are performed in collaboration with the group of Professor Ross MacGillivray (UBC), and our studies of bacterioferritin are performed in collaboration with the groups of Professor Geoffrey Moore and Dr. Nick Le Brun (University of East Anglia, U.K.). E. Bai, F.I. Rosell, B. Lige, B. Lelj-Garolla, M.R. Mauk, G.R. Moore, and A.G. Mauk. In recent years, IDO has been implicated in the pathophysiology of several human diseases by other investigators. For example, IDO has been implicated as playing a central role in the development of senile cataracts, and the expression of IDO by human tumors has been shown to be responsible for suppression of T-cell proliferation and thereby facilitate “immune escape” by these malignancies. Indoleamine 2,3-dioxygenase (IDO) catalyzes the first and rate limiting step of tryptophan degradation in non-hepatic tissues. Catalysis of a dioxygenase reaction (in which both atoms of a dioxygen molecule are incorporated into the product) by a heme enzyme is unusual because most heme-based oxygenases are mono-oxygenases, such as cytochrome P-450. Using a bacterial recombinant expression system for production of human IDO, we have developed a high-throughput screening strategy for identification of new IDO inhibitors that might be useful lead compounds in development of new therapeutic agents and that would be useful tools for investigation of the IDO mechanism. At the same time, we have been involved development of high throughput screening assays for IDO activity in vivo based on yeast growth. So far, we have used these assays to identify several new and potent IDO inhibitors in collaborative studies with Professors Michel Roberge (UBC, Biochemistry and Molecular Biology) and Raymond Anderson (UBC Chemistry and UBC Earth and Ocean Sciences). Studies of IDO chemistry and spectroscopy involving both the wild-type and variant forms of the enzyme are in progress. G.C. Brastianos, E. Vottero, B. Patrick, R. Van Soest, T. Matainaho, A.G. Mauk, and R.J. Andersen. A. Pereira, E. Vottero, M. Roberge, A.G. Mauk, and R.J. Andersen. Cytochrome b5 is a Major Reductant in vivo of Human Indoleamine 2,3-Dioxygenase Expressed in Yeast. Identification of Inhibitors of Human Indoleamine 2,3-Dioxygenase with a Targeted Cell-Based Screen in Yeast. E. Vottero, A. Balgi, K. Woods, S. Tugendreich, T. Melese, R.J. Andersen, A.G. Mauk, and M. Roberge. Hsp27 is a small heat shock protein that protects cells against oxidative stress-induced apoptosis, exhibits a chaperon activity that is not dependent on ATP, is up-regulated in some forms of cancer and has been reported to participate in a variety of biological processes. Although the molecular weight of Hsp27 is relatively low (22,500), it self-associates to form large oligomers in a process that is inhibited by phosphorylation. In recent work, we have studied the oligomerization of Hsp27 by analytical ultracentrifugation and have evaluated the participation of various structural domains by characterizing the behavior of a family of variants. Intriguingly, we have shown that formation of larger oligomers is enhanced by increasing temperature from 20 to 40 ° C and that the chaperon activity of the protein increases in parallel. Although numerous biological roles for Hsp27 have been identified and the involvement of the protein in various pathological processes is the topic of continuing investigation, much remains to be learned about the physical properties of the protein and the mechanism by which it prevents precipitation of unfolding proteins. For this reason, we are expanding our studies to understand the mechanism by which Hsp27 oligomerization is linked to its chaperon activity and the physical properties of Hsp27-substrate complexes formed during the course of Hsp27 chaperon action. In part, these studies emphasize the use of physical techniques to characterize the structural properties of complexes formed by Hsp27 with substrates of varying size and structural characteristics. Self-Association and Chaperone Activity of Hsp27 are Thermally Activated. B. Lelj-Garolla and A. Grant Mauk . Self-Association of a Small Heat Shock Protein. B. Lelj-Garolla and A.G. Mauk. Several of the areas of study described above involve collaborative interactions with groups at UBC and elsewhere as indicated. In addition, our group has a continuing collaboration with the group of Professor Michael Murphy that involves spectroscopic and physical studies of heme and copper proteins from bacterial sources that relate to nitrite metabolism and heme acquisition by these organisms. E.I. Tocheva, F.I. Rosell, A.G. Mauk, and M.E.P. Murphy. A.C. Chan, B. Lelj-Garolla, F.I. Rosell, K.A. Pedersen, A.G. Mauk, M.E. Murphy. E.I. Tocheva, F.I. Rosell, A.G. Mauk, M.E. Murphy . 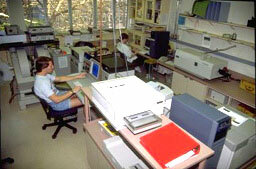 Excellent research facilities are available in our laboratory. Major instrumentation includes Jasco Models J-720 (UV-Vis) and J-730 (NIR) spectropolarimeters, an Oxford Instruments Model SM4 Spectromag for use in MCD measurements as well as an electromagnet for use at lower field strengths and temperatures near ambient, a Bruker Model 300E EPR spectrometer, a Perkin-Elmer System 2000 FTIR spectrometer, Cary Models 3, 210 and 219 spectrophotometers, an OLIS rapid scanning stopped-flow spectrophotometer, a fixed-wavelength stopped-flow spectophotometer installed in an anaerobic glove box, a laser flash photolysis spectrometer, a computer-controlled Radiometer Triburette for potentiometric titrations, potentiostats and cells for direct electrochemistry and spectroelectrochemistry, and vacuum lines and a controlled-atmosphere glove box for anaerobic sample manipulation. Access is also available to NMR spectrometers operated by Professors McIntosh and Cullis. Cold room, fermentation and FPLC facilities are available in our laboratory for preparation and purification of recombinant proteins.